The Captains is a documentary directed and hosted by William Shatner, best known as Captain Kirk in the original Star Trek (1966-9). Shatner has set out to interview each of the actors who played the captain in the successive incarnations of Star Trek – Patrick Stewart who was Captain Jean-Luc Picard in Star Trek: The Next Generation (1987-94), Avery Brooks alias Captain Benjamin Sisko on Star Trek: Deep Space Nine (1992-9), Kate Mulgrew who was Captain Kathryn Janeway in Star Trek: Voyager (1995-2001), Scott Bakula who was Captain Jonathan Archer on Enterprise (2001-5) and Chris Pine who inherited the role of Captain Kirk in the theatrical reboot Star Trek (2009). The documentary is both a depiction of the respective actors and Shatner’s digging into the issues that clearly concerned him – the personal toll the role took and what they discovered through the experience. Borrowing a few leaves from Kevin Smith, William Shatner took The Captains on a tour of North America where he personally introduced the show. The Captains is annoying to watch in many respects, especially for someone like me who comes from a background as a journalist. William Shatner has clearly had no training as an interviewer. In interviewing his subjects, he is constantly interrupting, talking over the top of them or springboarding off what they are saying to conduct his own digressions. This is particularly the case when it comes to Kate Mulgrew who is telling a clearly impassioned story of her life but Shatner is there interrupting her every few seconds to ask another question or reframe what she is saying rather than allow her to simply tell a story in her own words. Elsewhere he takes over Patrick Stewart’s telling of his first stage experiences and Scott Bakula’s recounting of his beginnings to talk about his own. When not doing that, he is offering up cod-psychoanalytic theorising about people’s motivations – even trying at one point to find deeper meaning in why Patrick Stewart was cast in the role of Shakespeare’s Shylock in a school play. For rightly or wrongly, William Shatner has a reputation as an egotist and a bad actor, while many of his ventures into writing and musical recording tend to be regarded as a bad joke in certain sectors of fandom. There were also the embarrassing revelations during the writing of his Star Trek Memoirs books of how most of his co-stars hated him – out of the various Star Trek regulars that appear throughout, Shatner notedly omits interviews with anybody from the original series. The Captains, though it nominally focuses on the other actors in the franchise, ends up revealing more about William Shatner than it does the other actors. Indeed, you get the impression throughout that Shatner was less interested in telling the story of the other Star Trek captains than he was in telling his own story through them and revisiting his roots – Christopher Plummer is interviewed supposedly because he played a role in Star Trek VI: The Undiscovered Country (1991) but in truth for no other reason than that he and Shatner worked together many years ago and it is a chance for Shatner to return to see his old friend and revisit Stratford, Ontario where he started out as an actor. The meeting with Chris Pine starts off with Shatner joking about Pine being him fifty years ago and turns into an impromptu arm wrestle between the two where you cannot help but feel that Shatner’s ego needed to go through a certain degree of one-upmanship and still prove himself. Even in the introductory scenes of him walking through a convention, Shatner seems to be mugging for the camera. In person, William Shatner gives the impression of someone who has mastered a certain social persona a long time ago and has kept retelling the same anecdotes so long that their storytelling has supplanted the truth in his own mind. One suspects that his recounting of his casting as Captain Kirk here is a self-congratulatory reminisce that gives him the credit for being the one who told Gene Roddenberry that they should introduce more humour into the characters. There is a bizarre encounter with an elderly down-and-out woman called Apple Annie on the streets of New York City where Shatner has to prod someone who clearly has a failing memory into remembering him and Star Trek and she does so in a vague way that is more about agreeing with him than having any clue what he is talking about. It is a piece that should have ended on the cutting room floor as it is embarrassing and frankly has a whiff of desperation for recognition to it. There is of course also William Shatner the much reputed womaniser – in a trip through a convention floor, he manages to tell three Star Trek actresses – Jeri Ryan, Grace Lee Whitney and Sally Kellerman – that each of them was the most beautiful woman to appear on Star Trek. One of them asks for a kiss on the lips and, after doing so, Shatner’s immediate response is rather hilariously to look around concerned and ask where her husband is. Shatner gets the most depth out of his subjects when talking about how the working hours affected their relationships and marriages (and his own). Patrick Stewart expresses genuine regret when he talks about how it ended his marriage, while Kate Mulgrew is moving when talking about raising children as a single mother and how the working hours affected them so much that they hate the show and have never watched it. 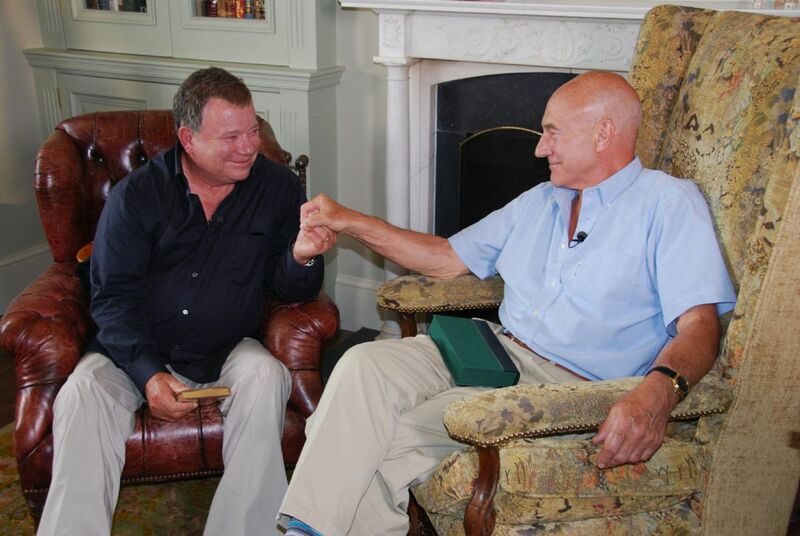 In talking to Patrick Stewart, Shatner confronts his own embarrassment with the role of Captain Kirk and how he eventually came to accept it, while Stewart addresses the question he was constantly asked as to whether he, a Shakespearean actor, was slumming it. William Shatner later repackaged the material as a five episode tv mini-series The Captains Close Up (2013). William Shatner had previously directed the fifth theatrical Star Trek film Star Trek V: The Final Frontier (1989), as well as TekWar (1994), the first of four tv movies based on his series of Cyberpunk novels, and the UFO film Groom Lake (2002). Shatner also wrote and created the tv movie Fire Serpent (2007) about alien fire beings, as well as hosted the documentary How William Shatner Changed the World (2005) based on his own book about the real world influence of Star Trek. He subsequently made another documentary about Star Trek fandom with Get a Life! (2012) and Chaos on the Bridge (2014) about the chaotic early years of Star Trek: The Next Generation.